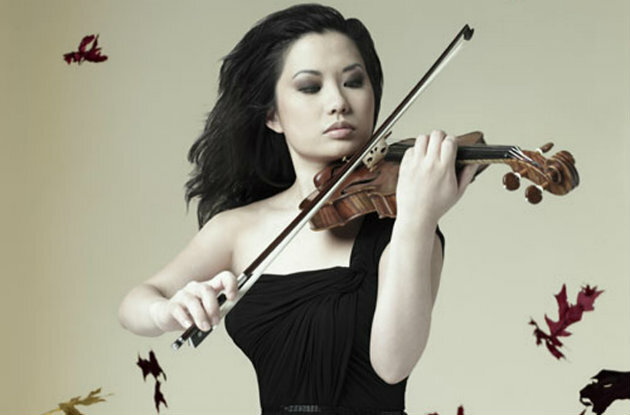 KALAMAZOO, MI — World famous violinist Sarah Chang will experience a couple of firsts when she comes to Kalamazoo this weekend. She will be attending her first musical competition and that competition — the Stulberg International String Competition — will be her first time judging a competition. Before she gets to her judging duties, Chang will perform with the Kalamazoo Symphony Orchestra at 8 p.m. Friday at Chenery Auditorium. Chang will perform Dvorak's Violin Concerto in A minor on a program that also includes Elgar's Froissart Overture and Beethoven's Symphony No. 5 in C minor. "The Dvorak is a beautiful piece and it's not done that often," Chang said from Philadelphia, where she was finally home for a few days — the first time in three months. "When people think of Dvorak th think of the New World Symphony or the Cello Concerto. I love this piece and recorded it several years ago. "It's incredibly beautiful and challenging. He really threw in the kitchen sink into this piece there are double stops and triple stops and quadruple stops. Then he balances it out with these gorgeous, lyrical folk melodies. I'm happy to be coming to Kalamazoo for the first time, and especially to be bringing this piece." Chang built an international competition with not one competition on her resume. That happens when the world labels you a child prodigy. Chang was a prodigy. She auditioned for — and was accepted — to Juilliard when she was 5. She debuted with the New York Philharmonic and the Philadelphia Orchestra at age 9. From there it was a whirlwind of recording contracts and performance dates with the top orchestras and conductors in the world. Now 34, Chang maintains a busy touring schedule. This season, she'll perform with BBC Scottish Symphony and in the Far East, Guangzhou Symphony, Shangahi Symphony and Taiwan Symphony. Highlights in the United States include appearances with the Cincinnati Symphony, Philadelphia Orchestra, Los Angeles Philharmonic, New Jersey Symphony, Ravinia Festival and Aspen Music Festival. "I understand the importance of what they can do for young artists," she said. "The prep is very good. Being given that opportunity to perform and be on stage with a live audience, I think that's fantastic. "But the whole idea of judging is difficult. Music is so interpretive. It's not a tennis game. I think that is where my reticence comes from when it comes to competition. But you look at some of the biggest artists and many of them did come through the competition circuit." Not having actually competed, Chang hesitated to offer advice to the dozen young performers competing at the Stulberg at Western Michigan University's Dalton Center Recital Hall on Saturday. But she did say she noticed one quality about her friends who did well in competitions. "They were all obviously solid players and incredibly musical," she said. "But more than that, they had nerves of steel. Literally, they could be playing and a car alarm could go off and it wouldn't bother them. They would be unflappable. Those sorts of nerves are essential for any performer." Chang said she was lucky to earn her nerves in a very different fashion. As a very young performer, she had teachers who taught her to appreciate her audiences — and not to fear them. "My teacher wisely taught me that the people in the audience bought tickets. They emptied out their calendars to see you," Chang said. "You should be grateful. You shouldn't feel like they're judging you. They're here to be your friend. "That's in my DNA now, when I go on stage and perform. It helped mold the whole performance experience for me." While in Kalamazoo, Chang also will offer a master class for a select group of performers who audition for the chance to play for her. Chang said she has only recently begun leading master classes. "I did my first master class when I was 16, because I was asked — and I swore I would stay away from it after that first experience," Chang said. "The students were older than I was. I thought, 'That was so ridiculous.' I felt like I was a student. You can't stick a 16-year-old on satge and have them give a master class." She told her manager to turn down any request to teach or to lead a master class, she said. She realized she just didn't have the maturity or experience to offer good advice to other musicians. It's only in the last two years or so that she has slowly begun accepting offers to teach. "Back then I was still very much learning and now I've been on stage exploring and figuring out my own voice. Now, I'm in a very happy, comfortable sort of place. I feel better about being able to share whatever I've learned throughout the years." Chang said a master class doesn't really provide enough time for a full lesson. So what she hopes to impart on the students is a clear and realistic view of the life they are considering. Yes, they'll talk about music, but more importantly, they'll talk about whether they're really prepared for the life they say they want. "There comes a time in every student's life where you sort of have to make a decision if you love music enough," she said. "It's not the performing, it's the lifestyle, the performing, the traveling, the rehearsing. You have to decide if the whole lifestyle is right for you. If it doesn't fit what you want, deciding that soon than later is essential. "I would really hope to be one of those very encouraging and honest and realistic voices."